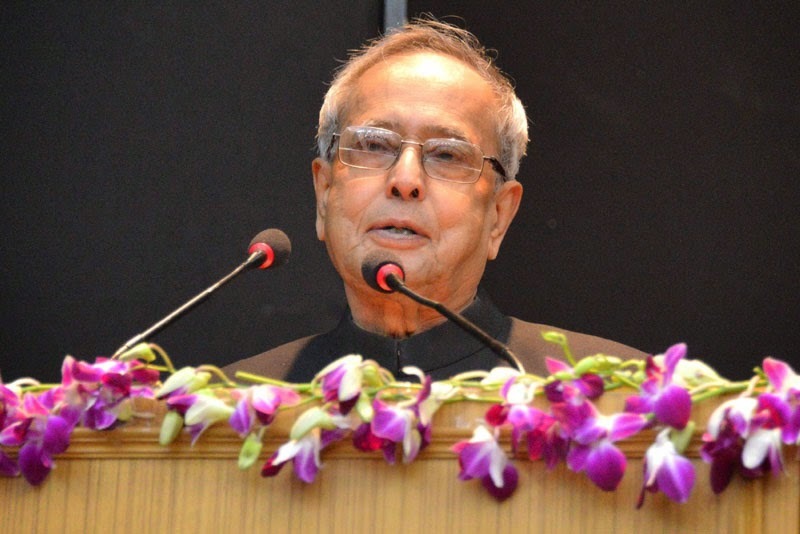 The President, Shri Pranab Mukherjee addressing at the valedictory function of the 89th Foundation Course for All India Services, at Lal Bahadur Shastri National Academy of Administration (LBSNAA), at Mussoorie, in Uttrakhand on December 12, 2014. The President of India, Shri Pranab Mukherjee attended the Valedictory Function of 89th Foundation Course for Civil Services at the LalBahadurShastri National Academy of Administration, Mussoorie today (December 12, 2014). 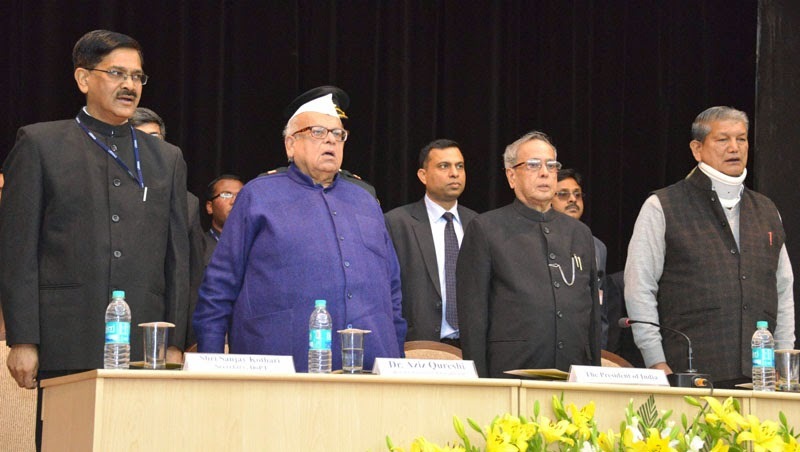 The President, Shri Pranab Mukherjee at the valedictory function of the 89th Foundation Course for All India Services, at Lal Bahadur Shastri National Academy of Administration (LBSNAA), at Mussoorie, in Uttrakhand on December 12, 2014. The Chief Minister of Uttarakhand, Shri Harish Rawat and the Governor of Uttarakhand, Dr. Aziz Qureshi are also seen. Speaking on the occasion, the President congratulated the young officer-trainees and said that they have entered the All India Services and Central Civil Services after clearing the Civil Services Examination, which is one of the toughest examinations in the country. He stated that these young officers of the nation, are going to work in various sectors of administration, furthering the cause of the nation in different spheres. He asked officers to remember that in whatever branch they are engaged in they should never lose sight of the pan-India perception which is welfare of the people and progress of the nation. The President said that the provisions of the Constitution of India have taken care of the evolving needs of our growing democracy. Adhering to our Constitutional charter, India’s governance framework has been geared towards upholding our democratic structure. The role of the civil service has to be perceived in the context of preserving these values. He said that good governance is the exercise of power, within the framework of the Constitution, for efficient and effective management of our economic and social resources for the well-being of the people, through the institutions of state. ‘Good governance’, as a concept, has been in vogue since the ancient times. Kautilya had mentioned about the inseparable link between the happiness of a king and that of his subjects. Good governance stands for a framework that has the singular agenda of well-being of the people. The President stated that Public administration plays a pivotal role in our polity. He advised the young officers that they should always be responsive to the needs of the public. They should adopt a rational approach while performing their duties. His Excellency Mr. Vladimir V. Putin, the President of the Russian Federation called on President of India, Shri Pranab Mukherjee at Rashtrapati Bhavan yesterday (December 11, 2014). Interacting with the Russian President, the President said India considers President Putin a great friend and the guiding force behind the strategic partnership between the two countries. India is fully committed to developing and deepening the India-Russia partnership in diverse areas. He was happy that during Mr. Putin’s present visit the two countries have outlined a joint document laying out the vision for enhancing the strategic partnership to a qualitatively new level in the coming years. Defence cooperation is an important pillar of the strategic partnership between India and Russia. Russia will remain a trusted and indispensable partner for India’s defence needs. India welcomes Russian participation in India’s defence sector in joint production, research and development and offsets. The economic dimension of the bilateral relationship has huge untapped potential. Expansion of trade and economic cooperation with Russia is a priority for India. The President said India appreciates Russia’s support for India’s permanent membership of the UN Security Council and the two countries should work together to make progress in this direction. India is also grateful for Russia’s support for India’s membership of multilateral export control regimes. 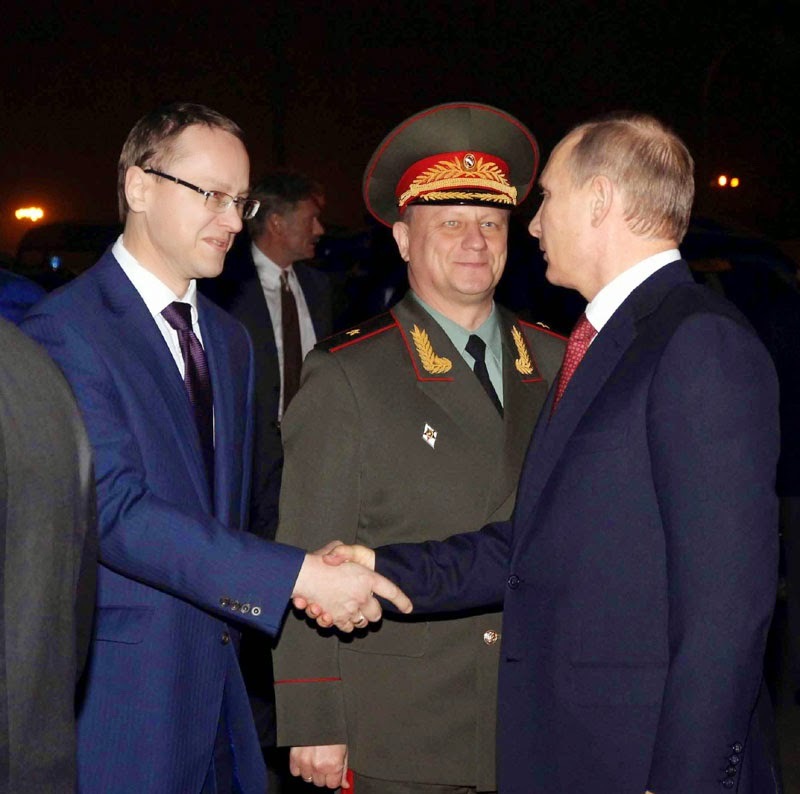 The Russian President told President Mukherjee that his visit has been successful and meaningful. Bilateral relations between the two countries are developing well. He agreed with the President that the two countries can do much better on trade and said Russia would be happy to enhance cooperation in various fields, including energy and defence. President Putin greeted President Mukherjee on his 79th birthday and gifted him copies of photographs and documentary films relating to Rabindranath Tagore’s visit to Russia in 1930. The President of India, Shri Pranab Mukherjee will receive the first copy of a Chinese book ‘An Odyssey in Tibet – a Pilgrimage to Kailash Mansarovar’ on December 15, 2014 at a function at Rashtrapati Bhavan Auditorium. This book written by Shri Tarun Vijay, Member of Parliament (Rajya Sabha) has been translated and published by the Sichuan University, China.